I’m a baseball fan. Okay, that’s not really accurate. I’m a baseball *fanatic*. I love the game, and I love watching it played. I don’t care if it’s little league, high school, college, minor leagues, or major leagues, I enjoy sitting at the ballpark (or in front of the TV) watching pitchers pitch, batters bat, and fielders field. I can’t get enough of it. I’ve been known to drive by a local ballfield, see a game going on, and stop by just to catch a few innings. Some of my “must see” players. Watching baseball of course means watching baseball players. Over the years I’ve come to enjoy watching certain players more than others. These players vary in their styles, but something about them makes me want to particularly watch them pitch or hit or field or run. My 13-year-old son of course is my favorite player to watch, but among MLB players, my favorites include: Joey Votto, Billy Hamilton, Ben Zobrist, Mike Trout, Bryce Harper, Andrelton Simmons, Johnny Cueto, David Price, Kevin Kiermaier, and Chris Archer. Each is a different type of player, but each brings something to the diamond that brings me joy to watch. 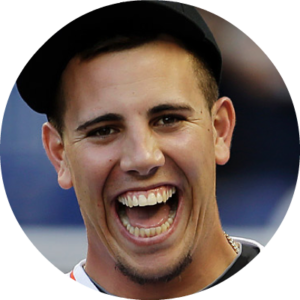 But one player in particular became my favorite of them all: Jose Fernandez, pitcher for the Miami Marlins, who tragically died last week in a boating accident. Last year, when he was recovering from Tommy John surgery, I was able to watch him pitch in a minor-league rehab start against a Rays minor league team. The one thing that was obvious is that he had “presence.” Everyone in the park – from the fans to the players to the managers to the umpires – followed his every move. When he was on the mound, he dominated the scene. Even though I don’t think he pitched very well that night, it was obvious to even the casual observer that he was light-years better than any other player on the field. He just commanded the stage like no one else and he was the most fun to watch. Millions of people had come to the same conclusion, making Fernandez one of the brightest stars in baseball. 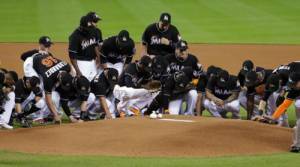 The death of a young person at the height of their career is always tragic, but Fernandez’s death seems especially tragic due to his backstory. He was born in Cuba, which means he was born in oppression. He desperately wanted to escape from the country, and on three separate occasions he attempted to defect to America. However, in all three cases he was captured and thrown into jail. This was before he turned 16! On his fourth attempt, while at sea someone yelled that a woman had fallen overboard. Without thinking he jumped in the stormy waters to save her, and only after he rescued her did he discover the woman he saved was his mother! They safely made it to Mexico, and were then able to enter the United States, where he quickly became a star high school baseball player in Tampa. After making it to the majors, announcers would often recount his amazing story, and whenever he was in a pressure-packed situation on the mound, they would surely remark that this was nothing compared to what he had faced as a teenager. He had overcome so much in his life that he seemed indestructible. Fernandez became one of the biggest celebrities in baseball and one of my favorite players, and this presented a problem for me. As my son became more and more interested in following baseball, I began to have what might be considered a peculiar concern. I’m disgusted by today’s celebrity culture, knowing the outsized impact celebrities have on many people, young and old. For some reason being famous has translated into becoming a role model for life. Unfortunately, however, when a father is trying to teach his boy about responsibility, strong moral fiber, and being a gentleman, today’s celebrities aren’t typically examples to follow. My concern was that as my son became a fan of certain players, he would begin to see them as larger than life, and of most concern, models for life. Of course there are good men who play baseball (Ben Zobrist immediately comes to mind), but most players today live like the culture around them, which is not the template I want my son to follow. I want him to be counter-cultural, eschewing the narcissism and arrogance of our popular culture. Marlins players honor their fallen teammate. But as much as I desired this, I found that I too sometimes got swept up in the celebrity of baseball. And the player who most exemplified that celebrity for me was Jose Fernandez. So when I first heard he passed away, I was shocked – both at his death and my reaction to it. How could the death of someone I had never met impact me so much? I found that I had made Fernandez larger than life in my own mind, and his death and my reaction to it was inexplicable to me. I first scolded myself for such a reaction, reminding myself that any death is a tragedy, and part of the human condition. The two young men who were with Fernandez that night and also died might not be famous, but their deaths were just as tragic. Yet as I thought about this, I realized that I was being too hard on myself, and too hard on anyone else who had put Fernandez on a pedestal. The fact was that this young man had performed some very admirable deeds in his life, and his chosen profession had brought joy to millions of people. To have that person taken away so suddenly and so unexpectedly is something worth mourning. I’m sure he wasn’t perfect, but none of us are, and we can admire the commendable qualities in others without ignoring their faults. I still worry about the power of celebrity. After all, what about throwing a baseball 100 mph makes someone a good moral example for others to follow? Yet we can still look at celebrities and appreciate what they do give us: some joy to lift our hearts and bring us closer together. And that’s something worth celebrating, and something to lament when it is taken away from us too soon.